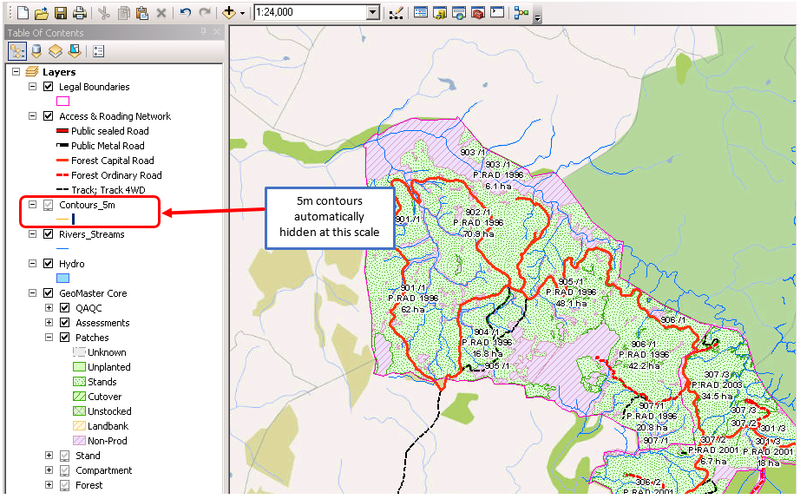 Keeping productive when using GeoMaster and ArcGIS can be simple, but when overlooked users are often bogged down by the effects of long redraw speeds in GIS systems. This does not have to be the case and takes just a few moments to sort out. Two of the best ways to optimize layer drawing are to draw them only at appropriate scales and use attribute queries to avoid drawing unnecessary features (the latter I will cover in another blog post). This quick tip article will look briefly at this first concept of hiding certain layers and features automatically. If you don’t need to display a certain layer when your map is at a certain scale, turn on scale dependency. For example, if you are zoomed out to a regional level, you can use scale dependency to turn off the GeoMaster patch layer and display just the forest boundary layer automatically. A detailed layer like the GeoMaster patch layer or 5m contours you should draw only at larger (zoomed-in) scales. If a detailed layer needs to be drawn at smaller scales, use simpler symbology at that scale to expedite drawing. 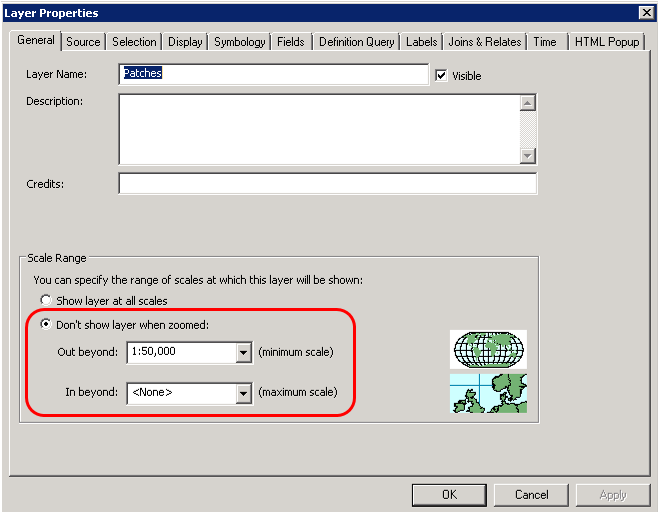 You can learn more about setting scale dependency in ArcGIS here: Displaying layers at certain scales. 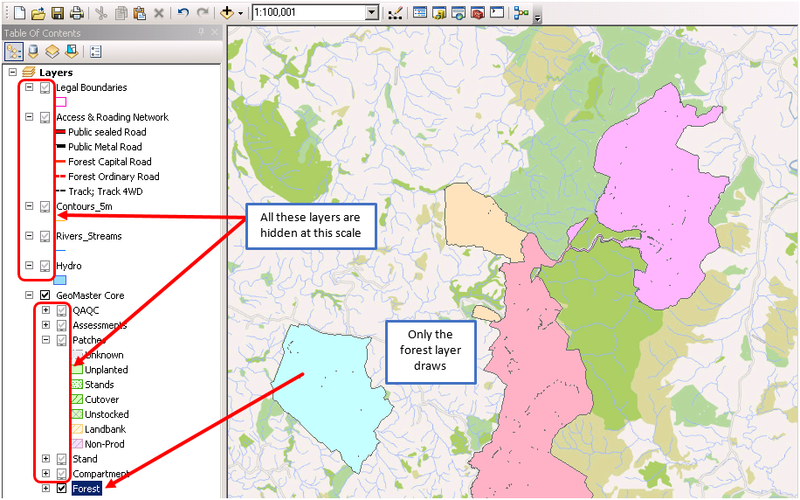 For example in Figure 1, you can see a view of the forests, but zoomed at over 1:100,000 scale, we are just seeing the forest boundary layer created by GeoMaster (normally you would also display labels of course but I have turned these off for display in this blog post). Figure 1 – Example GeoMaster view of Forest Boundary layer at small scale (zoomed out). Redraw speed at these scales is extremely quick. 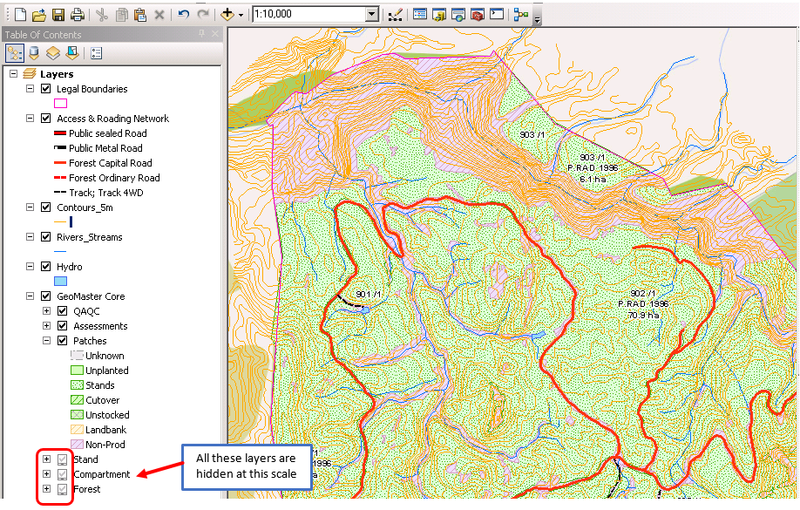 But when zoomed in to 1:10,000, the details layers including contours, GeoMaster patch layer and other detailed topographical layers are automatically turned on, as shown in figure 2. Figure 2 – Example of detailed features being turned on at larger scales (zoomed in). Getting this right makes a huge difference in the productivity of moving around the map and zooming in and out at features. For example a simple change like shown in figure 3 where at 1:24,000 I have hidden the 5m contours changes the redraw speed as you pan around the map from several seconds, to instantly appearing. This greatly reduces frustration and you are unlikely to need 5m contours at these smaller scales (zoomed out). It maybe that you could still have contours by maybe 20m or 50m ones only, but I will cover that in another blog post. Figure 3 – 5m Contours being hidden at scales greater than 1:10,000 scale. And so you can display any of your layers at different scales, this being set at the layer properties > general tab.